Dr. Grace graduated from Kasturba Medical College, one of the prestigious institutions in India. Post-graduation MRCOG from Royal College of Obstetricians & Gynecologists, London, UK in 1978. Worked in UK for 6 years. She was conferred FRCOG in 1990 by The Royal College of Obstetricians & Gynecologists, London, UK. Worked in different GCC Countries since 1981. Also in Brunei for 6 years. Had been in Dubai for over 16 years, working in the American Hospital, Mediclinic – Dubai Mall and City Hospital. Senior Lecturer in Queensland University of Australia. 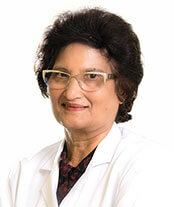 Dr. Grace Jacob’s specialty is Gynecology (OBGYN) and currently works as a Consultant Obstetrics and Gynecology.